Is this New England’s best barbecue? An order of brisket at BT’s Smokehouse in Sturbridge. Make a pilgrimage to Sturbridge’s meat mecca and you’ll learn the rules. It takes a few more trips to learn the secrets. You don’t snag a table until you’ve ordered at the counter. That’s a rule. But why is even the cucumber salad so good? That’s a secret. Ten years ago, when Brian Treitman launched B.T.’s Smokehouse, it was just a trailer at the Brimfield Antique Show, which kicks off the 2017 season May 9. It was a way for Treitman, working in restaurant kitchens in Boston but commuting all the way from Central Massachusetts, to make a little extra cash one weekend. But a weekend turned into a month and then a year. He never stopped. Now, two expansions and thousands of pounds of brisket later, the old trailer is in the parking lot and the line of customers sometimes snakes around the small dining room and out the door. This secret is out: It’s quite possible — likely, even — that the best barbecue in the region is coming out of a tiny, homespun corner lot next to a gas station in a town of about 10,000. 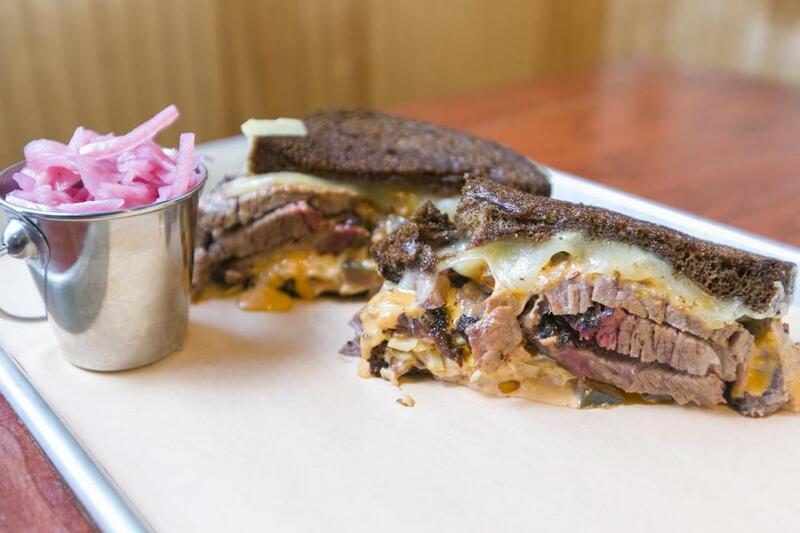 I’ve made more of these pilgrimages than I care to admit, wolfing down brisket Reuben sandwiches — huge hunks of perfect brisket, cheese, slaw, grilled bread. This might sound like heresy to some fundamentalist barbecue zealots (there are a lot of them around lately). But one bite ought to shut most of them up. A brisket reuben at B.T.’s Smokehouse. The best barbecue has always been sort of homespun. It emerges through trial and error and makes do with whatever is available; it takes a long time to cook, and even longer to cook well. That’s why “barbecue” means so many different things in different parts of the country — brisket, ribs, and sausage in Texas; pork in bright vinegary sauce in the Carolinas; and all manner of meats slathered in sauce in Kansas City, to name three of many. 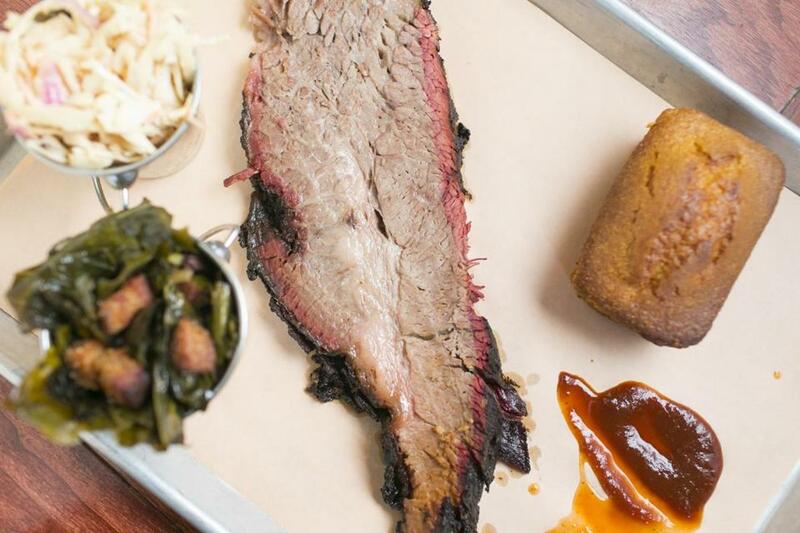 Unlike so many dubious barbecue restaurants that appropriate every style but master none of them, B.T.’s appears to have found its own way out of the smoke. Treitman said he started smoking meat after someone left a few Home Depot gift cards at the bar where he was working. He spent the money on a little Char Broil smoker, invited some winemaker friends over, and had a blast. From there, it was a process of experimentation. A Culinary Institute of America-trained chef with experience in high-end kitchens in Napa Valley and Boston (Ken Oringer’s KO Prime, Ming Tsai’s Blue Ginger), Treitman recalled a night early on, surrounded by half-cooked briskets sometime well after midnight, baffled about what to do next. After a week or so of fiddling, he started to figure things out. Treitman has upgraded smokers a few times since then, and now cooks on an old J&R Oyler Pit, salvaged from an old KC Masterpiece restaurant, that holds 1,400 pounds of meat. “We call it Black Betty,” Treitman said, and into the all-wood pit he feeds a mix of apple, hickory, and black cherry wood. And the meat that emerges from Black Betty hours later — 26 hours, in the case of brisket — is revelatory. Rimmed with salty black bark from the rub and smoke, tender enough to pull apart easily with your fingers, the brisket is sliced thick before being piled into a sandwich or on an aluminum tray lined with butcher paper. By the totally unreasonable standards of my fat-blasted trips through Texas, Treitman prefers his brisket smoked perhaps a bit longer, sometimes to the point of falling apart rather than just barely holding its shape. I don’t claim to have visited every barbecue joint in New England, but so far, BT’s brisket is unrivaled in these parts, and it’s not particularly close. Pulled pork, available in a platter with side items or by the cup, pint, or quart, is smoky and soft, with generous ribbons of crisp, fatty bark buried in every pile. 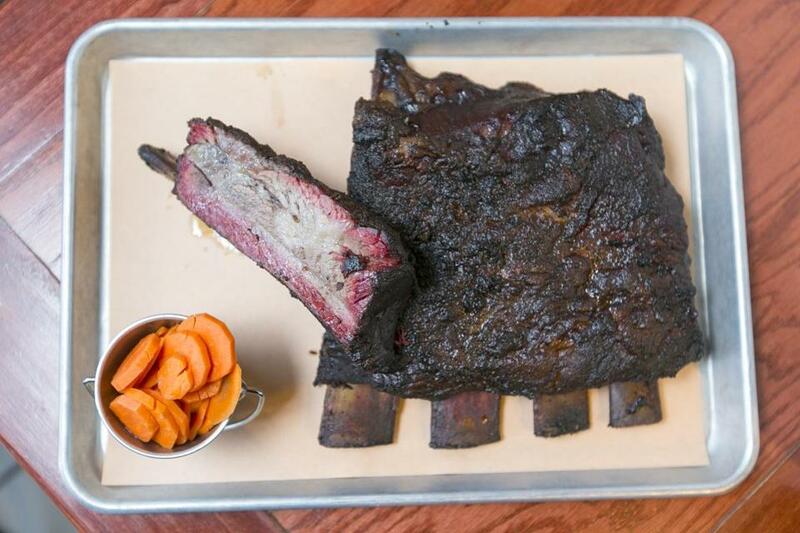 Pork ribs are available St. Louis cut — with the brisket bone cleaved off — or as full spares. Both varieties are deeply smoky and, like everything here, unsauced (ribs that arrive drenched in sauce are often the mark of a kitchen that’s hiding something). Chicken is smoked and shredded, a milder substitute for pulled pork. And though I’ve long been leery of barbecue side dishes — some famed pitmasters barely even bother — this is where Treitman’s training transcends. Several sides favor bright acidity. Cuke salad, slaw, toothsome black-eyed peas, and collard greens are all varying degrees of vinegary. But instead of being overwhelming, they serve as perfect accompaniments to the rich, fatty meats. Tear off a brisket end with your teeth, the generous fat cap melting behind the crust, and you might be done for the day. But a mouthful of tart slaw or greens in between somehow salvages the palate. Now, the next bite of beef is just as good as the last. Unlike so many dubious barbecue restaurants that appropriate every style but master none of them, B.T.’s appears to have found its own way out of the smoke. Some days are crazier than others. Wander in on an innocuous Wednesday afternoon, and you’ll find the place overrun with people who just made the pilgrimage to Tree House Brewing in Monson, a few miles east on Route 20. The brewery sells some of the most sought-after beers in the world and draws big crowds who come for 12 cans of beer per person, the typical Wednesday allotment. Beer in hand, they — OK, fine, we — head for B.T.’s, which doesn’t serve alcohol but is perfectly happy if you bring your own. The brewery now accounts for about 15 percent of B.T.’s business, Treitman said. And this week will be even busier, as the antique show that birthed B.T.’s a decade ago descends on nearby Brimfield. It’ll be the first year the old trailer won’t set up shop at the show. But the line moves fast — even faster with a few cans of some of the world’s best beer — and everybody is in a good mood here. Some of them — OK, fine, some of us — love it. A full rack of beef ribs at B.T.’s Smokehouse. 392 Main St., Sturbridge, 508-347-3188, www.btsmokehouse.com All major credit cards accepted. Wheelchair accessible. Prices Snacks $3.50-$9. Platters $10.50-$21. Meats and sides all available a la carte. Hours Tue-Sat 11 a.m.-9 p.m., Sun noon-8 p.m.